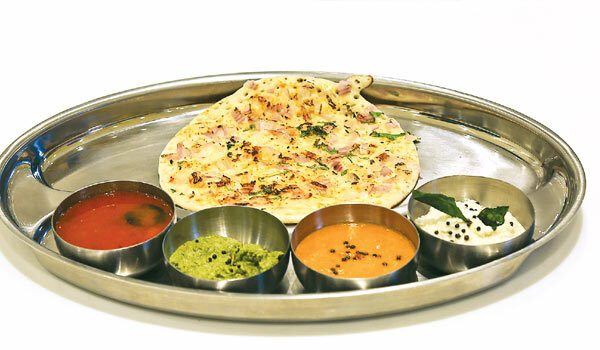 The new vegetarian restaurant in town, Sambhar, offers homely fare with interesting variants . With five different variants of the sambhar on their menu, the name of the brand is well picked, but offers more than just South Indian staples. Their multi-cuisine spread includes a live chaat counter, besides Chinese, North Indian and some Italian options. Srinivasan, who was formerly with the SPI group (think ID restaurant) for a decade, says, a�?There is always a demand for a vegetarian restaurant, especially with so many converting to vegetarianism for health reasons. We also have many communities that believe in vegetarianism.a�? The chef adds that most of the South Indian recipes here are from his mother and grandmothera��s kitchen. Besides the usual suspects (coconut, tomato and onion), the chef surprises us with the chutney of the day, an experimental cucumber. a�?Our peanut chutney is a big hit, too,a�? he says. We finish with a saffron-infused kesari, even as Srinivasan informs that a�?all our ingredients are natural and freshly prepared. We use no synthetic or frozen add-ons. In fact, even our dosa/idli batter is allowed to ferment naturally.a�? Of course, we agree to a filter coffee before leaving, and it turns out to be delightfully strong, served in a generous steel tumbler and dabarah. With restaurants like Jonaha��s Bistro and its ilkA� under the Paulsons umbrella, we are not surprised that soon Sambhar will also be taken across the country and abroad.